Malcolm Little was born in May 1925 in Omaha, Nebraska. He was raised in a very religious family as his father was a Baptist pastor and an avid follower of the noted Black Nationalism activist, Marcus Garvey, who advocated the “back-to-Africa” movement for the African-Americans. During his childhood years, the young boy struggled against racism. In those difficult times, Malcolm X was forced to move several times from his birth place. His Michigan house was destroyed completely by fire; his father was murdered mysteriously, and added to his misery, four of his uncles were brutally slain by white supremacists. In the 1930s, due to the Great Depression, Malcolm X’s family badly suffered, while fully depending on public funds for a while. Later, he was separated from his siblings when his mother became mentally ill, and he was sent to foster homes in several state and public institutions and boarding houses. He was charged with juvenile delinquency at the age of 13 and subsequently became a middle school dropout when he was merely 15. Malcolm X lived in Boston, Massachusetts in his sister’s home and did odd jobs shining shoes, being a bus boy and waitressing to earn a living. He also started paying visits to black ghettos, particularly which of Roxbury, as he became involved in a criminal life including drugs, gambling and burglary related activities. Malcolm X decided to permanently leave for the New York City’s Harlem neighborhood in 1942, where he became popularly known as the “Detroit Red”; a nickname attributed to his dark red hair. He made a return to Boston when the local police started cracking down on his criminal actions. Malcolm X was jailed for 10 years in 1946 for burglary. In prison, Malcolm was drawn to reading about philosophy, theology and history. He also came to know about an Islamic religious group, the Black Muslims, which was headed by Elijah Muhammad. He became interested in Elijah’s teachings that told the Black Muslims to dismiss the Western white civilizations and advocated independence for the Black Americans. In the meanwhile, he also prepared himself to become a skilful public speaker, learning good vocabulary and practicing different motivational speech techniques. Malcolm became finally free from prison confinement in 1952, after which he went on to join Elijah Muhammad in Chicago, Illinois. Elijah and the Black Muslims embraced him, giving Malcolm his now-legendary name “Malcolm X”, where “X” represented his “slave” name. He then became the assistant minister at the Detroit Mosque. After one year, he moved back to Chicago to learn more from and work under Elijah Muhammad. He was then assigned to supervise a mosque in Philadelphia, Pennsylvania, and in 1954, another mosque in Harlem. Malcolm X soon became one of the most popular and influential national spokesmen for the Black Muslims, in addition to being an expert speech-writer and a distinguished philosopher. His ultimate aim was to end racial separation and discrimination. He convinced thousands of black Americans to give up their Christian faith and join the Black Muslim movement. Malcolm even urged the African-American people to shun the presidential elections, scorning the “immoral political system” of the country. Malcolm married a young student nurse, Betty Jean Sanders, in 1958. She was renamed “Betty Shabazz”, and the couple had 6 daughters together. The Black Muslim movement gained national popularity in 1959, reaching its peak in the early 1960s. Rumors were rife that Malcolm wanted to remove Elijah Muhammad and take on the leadership. In 1963, after his unethical remarks regarding John F. Kennedy’s assassination, Malcolm X was suspended for 90 days by Elijah Muhammad. He surprised everyone with his public announcement that he was permanently leaving the Nation of Islam to start his own two organizations; namely the Muslim Mosque, Inc., and the Organization of Afro-American Unity. Malcolm, however, continued to believe in the Islamic faith. Malcolm X starting traveling various countries of Africa and Europe. His most important trip was to Mecca – the birthplace of Muhammad and the holiest city of Islam. It was where he said he found the “true meaning” of the Islamic religion. Malcolm again changed his name to “El-Hajj Malik El-Shabazz” after the tour. Malcolm X later declared his plans to carry the black struggle to a worldwide audience, and appeal to the United Nations. To achieve this goal, he took help from various African countries. He also announced that he was open to work with other black as well as white organizations on voter registrations, the control of blacks in the community schools and police, as well as various political and civil rights. For this purpose, he started to hold meetings to discuss his policies and plans of his organizations, in one of which he was famously assassinated, on Sunday, February 21, 1965. Ever since he died, his influence on the social and political outlook of the African American people increased tremendously. There are various pieces of literature to be found on this aggressive leader, one of the classic is his autobiography entitled The Autobiography of Malcolm X, by Alex Haley. 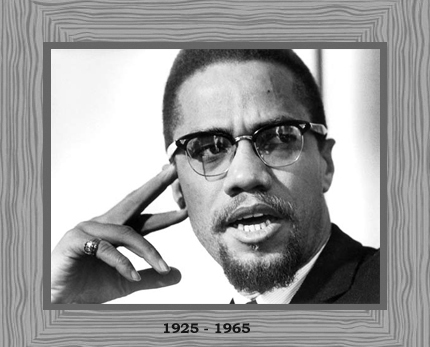 Also, the Malcolm X Liberation University in Durham, North Carolina, the Malcolm X Community College in Chicago, and the Malcolm X Society are named after him to pay tribute to this great black leader who became the voice of Black Nationalism and took aggressive action to fight racial discrimination.